Amazon already offers some great perks for Amazon Prime subscribers. However, it has now added another benefit in the form of Prime Reading. 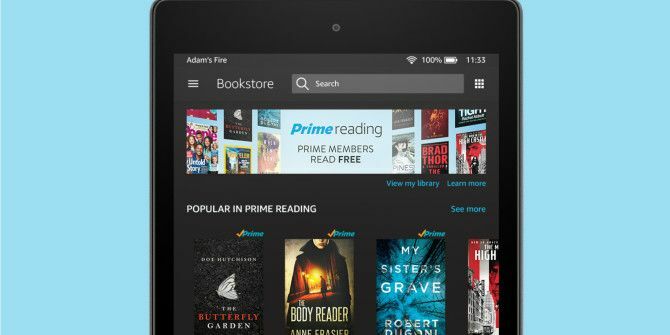 This offers Amazon Prime subscribers unlimited access to more than 1,000 eBooks, magazines, short stories, comic books, and more. All for free. An Amazon Prime subscription isn’t cheap, setting you back $99 every year. So, to sweeten the deal, Amazon has added a multitude of great benefits for Prime subscribers 10 Awesome Amazon Prime Benefits You May Have Overlooked 10 Awesome Amazon Prime Benefits You May Have Overlooked Free two-day shipping is just the beginning. Here are some notable Amazon Prime subscription benefits you may not know about. Read More . This includes free shipping, the Netflix-like Prime Video, the Pandora-like Prime Music, and more besides. And now it has added Prime Reading. Prime Reading offers Prime subscribers unlimited access to 1,000 popular Kindle titles, including The Hobbit, Harry Potter and the Sorcerer’s Stone, and The Man In the High Castle. Plus a rotating selection of magazines including People, Sports Illustrated, and Popular Mechanics. Plus Kindle Singles from the likes of Stephen King, Norman Mailer, and Kurt Vonnegut. The all-you-can-eat Prime Reading content is available on Kindle e-Readers, Kindle Fire tablets, and the Kindle apps on Android and on iOS. Prime Reading is essentially Kindle Unlimited Lite, as the latter offers access to 1 million eBooks, audiobooks, and magazines for an extra $10-per-month 5 Reasons a Kindle Unlimited Subscription Isn't Worth Your Money 5 Reasons a Kindle Unlimited Subscription Isn't Worth Your Money A subscription service for Kindle ebooks sounds great, but Amazon’s Kindle Unlimited subscription isn't worth the money. Here's why. Read More . Prime Reading is, unfortunately, only available in the U.S. for the time being. Prime Reading is a genius idea. Amazon Prime is already great value for money, so any perks added at this stage feel like Amazon being somehow generous. It isn’t actually being generous though, of course. Instead, it’s just trying to lock Prime subscribers into the Amazon ecosystem. Because Amazon needs you as much as you need Amazon. So Amazon announces Prime Reading…but you know how else you can read ebooks for free on your Kindle or Nook? Most libraries have ebooks! Still, Prime Reading is yet another reason to subscribe to Amazon Prime. And we’re not dumb enough to turn down having 1,000 extra pieces of content plonked on our doorstep at no extra cost. Are you an Amazon Prime subscriber? If so, will you be making use of Prime Reading? How many Prime perks do you already use on a regular basis? Which Prime perks would you miss if your Prime membership ended tomorrow? Please let us know in the comments below! Explore more about: Amazon, Amazon Prime, Ebooks. Hubby is a prime member and I am a kindle unlimited member. We use the free shipping the most. I use pretty much everything I know about that Amazon offers with Prime. The only service Amazon provides that I don't use much is the app store. I've seen a few books that look interesting, but not a whole lot. Hopefully they add more over time.